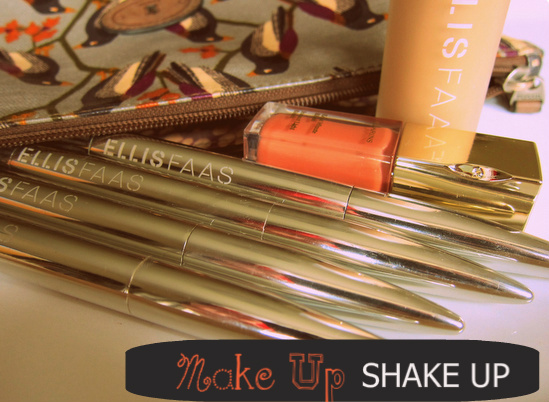 Welcome to week 6 of the Make Up Shake Up series, where I give you a sneak peek into the contents of my weekly make up bag. Things are a bit different this week as most of the products I'll be using are from just one brand, the absolutely fabulous Ellis Faas. This niche brand, created and named after the Dutch make up artist, is truly innovative - all products are liquids or creams, and based on a colour palette found naturally in the human body. Most of them come in these amazing silver pens - you can read about my first purchases from the brand here, after which they sent me a few more bits to play about with. I'll give you my full thoughts on them soon. EYES: Ellis Faas Creamy Eyes eyeshadow in E107 - a gorgeous greyish brownish taupe - teamed with the brand's mascara. LIPS: Ellis Faas Milky Lips in L205 - this is a billed as a fluid lipstick and is a really pretty corally peach. CHEEKS: The only non-Ellis product, this Clarins Instant Light Blush is almost exactly the same shade as the Milky Lips colour so I think they'll work really well together. FACE: I'll be trying Ellis Faas Skin Veil foundation - I have it in the pump bottle but it also comes in one of these metal pens. And I'll also be using the EF liquid concealer on my dark circles and blemishes. What do you think of this week's products? If you've tried any of them, let me know how you got on! You can buy Ellis Faas in Harvey Nichols or through their website, which was recently revamped. I've never heard of this brand so will be interested to know your thoughts about it. Like everyone else, haven't heard of this brand before, where did it originate? The textures look really lovely. I really need to take another trip out to Dundrum and take a closer look at the Ellis Faas products, ever since they were released I've just thought the concept was amazing, the packaging it to die for aswell! Dying to try out the clarins blush too! that sounds so great! i havent heard of this brand, i am a little behind when it comes to make up, which is why i appreciate blogs like yours. thanks for the product info! I've not ever seen this brand.. the coral is lovely! I've never heard of Ellis but it sure sounds like a great cosmetics line! I've never heard of them or tried them before. Can't wait for your review. 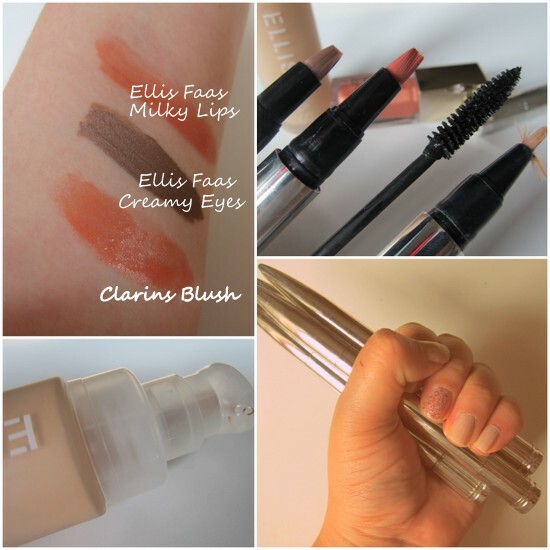 I love the ellis faas foundations, i think they are really great quality. I wish they would do a wider colour range in their lips and eyeshadows.